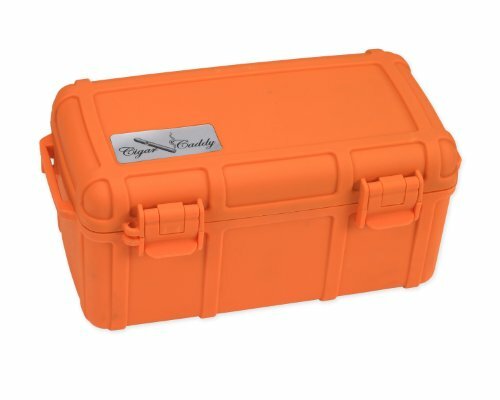 15 Cigar - Waterproof Travel Humidor - Blaze Orange Rubberized Exterior. The ideal travel humidor made for people on the go, or avid outdoorsmen who want ultimate protection for their cigars during their commute, while exposing them to the various elements of nature. This portable humidor holds up to 15 Churchill cigars and it's made from super strong ABS molded plastic. It floats on water. The crush-proof case can withstand temperature range -10 to 175 Fahrenheit. Equipped with 2 removable/replaceable locking clasps, stainless steel latch hinges, molded lock ring for added security, and coin release for air pressure. Manufacturer: Quality Importers Trading Co, Inc. Publisher: Quality Importers Trading Co, Inc. Studio: Quality Importers Trading Co, Inc.